The Alaskan Klee is a small version of the Alaskan Husky with a wedge-shaped head featuring a striking masked face, prick ears, and a double coat. The length of body is just slightly longer than the height. 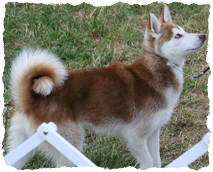 The tail is well-furred and curls over the back or to either side when the dog is alert or moving. 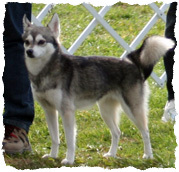 The appearance of the Alaskan Klee Kai reflects the breed's Northern heritage. With two different coat lengths. The above are short coats and below is a full coat. 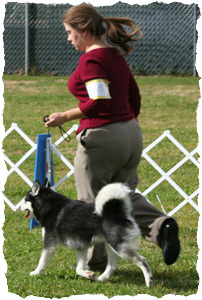 The Alaskan Klee Kai is very curious, active, quick and agile. His loyalty and alertness make the Alaskan Klee Kai an excellent watchdog who may be territorial despite his small size. While affectionate with family members, the Alaskan Klee Kai is reserved and cautious with strangers and in unfamiliar situations. 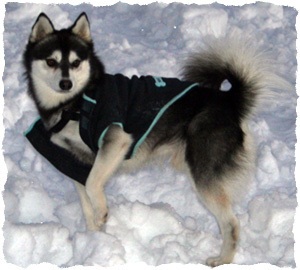 The Alaskan Klee Kai may be the perfect dog for some people, but it isn't a dog for everyone. Here's some things you should consider before bringing an AKK into your home. Like most dogs, without proper training they can be very destructive chewers, they are highly intelligent so the become bored easily. They seem to have an almost endless amount of energy and spend a lot of it getting into trouble unless you have the time to teach them appropriate ways of disposing of it. Chewing is one thing they will do to burn off energy, so is digging. Many people think letting their dog run around the backyard all day is a suitable exchange for taking them for a walk, this is not the case. AKK's need to be walked. 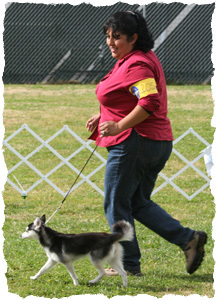 They need it for the socialization as well as the exercise and the strengthening of their view that their owner is their pack leader. AKK can be loud, VERY loud. They are very vocal little creatures and they have a lot to say. AKK owners quickly become used to the 5-10 min greetings when they come home where their AKK must tell them all about the things they missed while gone, or perhaps its a brow beating for leaving them behind. If you have neighbors that don't like a lot of noise they may not like your AKK. Expenses. These are no more than they would be for any other dog but they are still something you should take into consideration before adding a new canine family member. Your new puppy we need to finish it's vaccinations usually 3 more sets of shots plus their rabies. These can cost as little as $20 a visit to about $50 a visit. Your puppy or dog needs to be on a good diet. A bag of good dog food is going to cost you anywhere from $30-$60 dollars a bag. You will want to have them micro chipped if they haven't had this done already. That's another $35 to have it implanted and around $20 to register it. Speaking of registration, that's another $16 to UKC. We also need to account for toys, cleaning products, leashes, beds, crates, replacing things your puppy destroyed, having them spayed or neutered which is usually between $50 and $200. And we can't forget obedience classes that run about $100 - $150 per 8 weeks. You normally want to do about 3 sets of these 8 week classes. Yearly exam with full blood work, that's between $100 and $200. Last but not least, kennel fees for when you go out of town and can't take your dog with you. This runs about $35 dollars a day. This is not including any additional emergency things that might come up. Cleft Palettes - a condition where the roof of the mouth is not closed and the inside of the nose opens into the mouth. Cryptorchids - a condition where one or both testicles do not descend into the scrotal sac. FVII - a clotting factor deficiency that rarely produces clinical signs. Juvenile Cataracts - A cataract is any opacity or loss of transparency of the lens of the eye. small non-progressive cataracts will not interfere with vision. Luxating patellas -a condition where the knee caps slide in and out of place. Pyometra - an bacterial infection of the uterus where it fills with pus. Umbilical hernias - a break in the abdominal muscle wall at the point where the umbilical cord enters the body. I could tell you the story second hand of how these little dogs came about, but why do that when you can get the story first hand from the lady who developed the breed, Linda Spurlin. 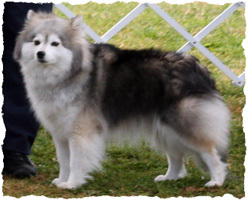 The Alaskan Klee Kai was developed in Alaska by Linda Spurlin and her family, to be a companion-sized version of the Alaskan Husky. From the early 70's through 1988, the Spurlins carefully selected dogs who met their high standards for appearance and soundness. 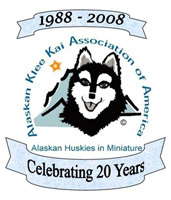 In 1988, they made the Alaskan Klee Kai available to others. 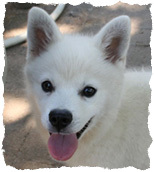 Mrs. Spurlin originally called her new breed the "Klee Kai" but in 1995, it was changed to "Alaskan Klee Kai." 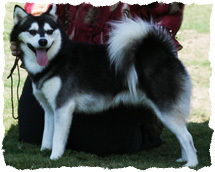 The Alaskan Klee Kai is still extremely rare. 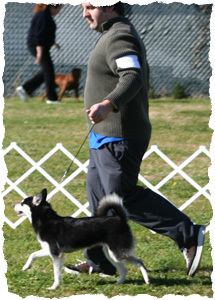 The AKK was recognized by the American Rare Breed Association (ARBA) in 1995 and by the United Kennel Club (UKC) on January 1, 1997. World of Wonder Alaskan Klee Kai.